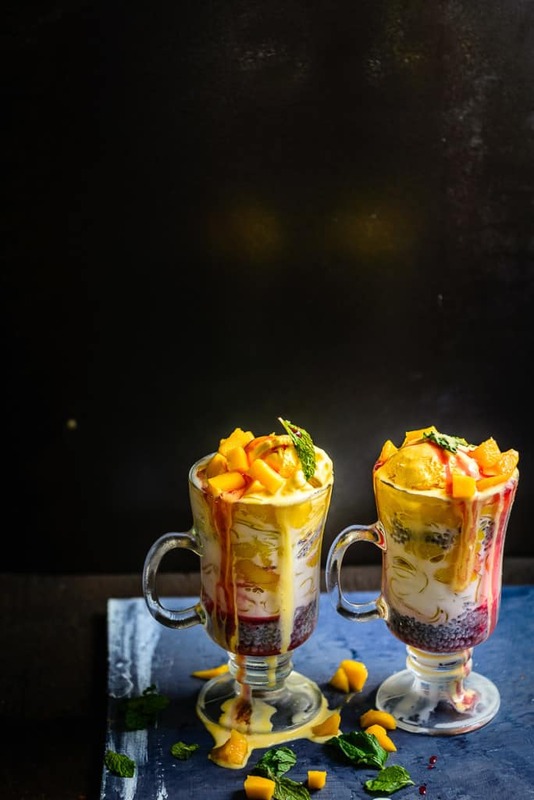 Mango Falooda is a delicious beverage or dessert with layers of falooda sev, milk, basil seeds and fresh mango pieces and mango puree layered in a tall glass. It is a delight to eat and one of the best mango recipes. Here is how to make Mango Falooda. Falooda was gifted to India first time by Persians. The Persians were very fond of this dessert. As various Muslim merchants of Persia traveled to India, they introduced this rich dessert to our country. But the version of Falooda that we relish today was propagated by the Mughal Empire. 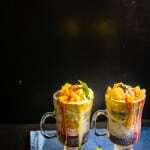 With time and tide, the recipe of Falooda underwent various transformations however, its royal taste remained untouched. Falooda is primarily prepared using basil seeds (sabja seeds/takmaria / Falooda Seeds), milk, rose syrup, vermicelli or Falooda Sev et al and then as per different flavors, variation of ingredients is inculcated. The other day with the fresh stock of mangoes that I had recently bought, I prepared Mango Vanilla Smoothie and even Mango Falooda. Mango Falooda has to be one of the best flavors of falooda that one would ever taste. Mango and milk definitely create an awesome combination and as I had even added mango pieces and mango ice cream for making this delicious falooda, it tasted wholly more luscious. As Falooda has many layers including that of rose syrup, basil seeds, falooda sev, milk it feels like a luxury every time one relishes this creamy dessert or beverage. You could buy squashes available in the market to experiment with the recipe or try seasonal fruits like mango, strawberry et al or even use chocolate for making falooda. With the help of my simple recipe of Mango Falooda, I am sure you would be able to prepare a wonderful dessert and perk up parties as well as get together’s. So make this recipe this season of mangoes and impress your friends and family. Mango Falooda is a delicious beverage or dessert with layers of falooda sev, milk, basil seeds and fresh mango pieces and mango puree layered in a tall glass. Heat milk and sugar in a pan and cook until sugar is dissolved. Remove the pan from heat and let the milk cool. Soak basil seeds in enough water for 30 minutes. Cook falooda sev according to manufacturer’s instruction. Add a tbsp of basil seeds in each glass. Pour 1 tsp of rose syrup..
Top with 2-3 tbsp falooda sev. Add 2 tbsp of mango puree on top. Repeat the process once again. Top the glass with mango ice cream and mango pieces.